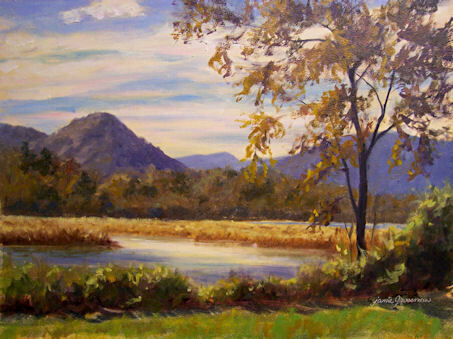 This is one of my plein air paintings that hung around the studio for months waiting to be finished. Well, today was the day! There is a magical, little brook that comes down from South Mountain and through our property upstate. It flows under a bridge that spans our driveway, and cascades down moss-covered rocks in a small waterfall. I didn’t even know it was there until after we’d bought the house, but I’ve been entranced by it ever since. It seems to be compositionally perfect from nearly any angle. 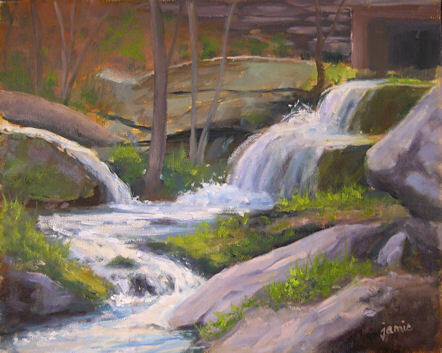 So far in addition to this one, I’ve done one gouache sketch of it from the other side, a monochrome painting sitting on one of the rock ledges where the water cascaded past me, and an oil painting from the other side of the brook while the phlox was blooming in fall. In spite of all these views of the scene, I feel I’ve barely scratched the surface of the hundreds of fantastic compositions possible from this special little place. There are numerous other waterfalls in and around the property, and although this one is the smallest, I feel it is by far the most beautiful. I lost my favorite old palette and had to replace it this week. 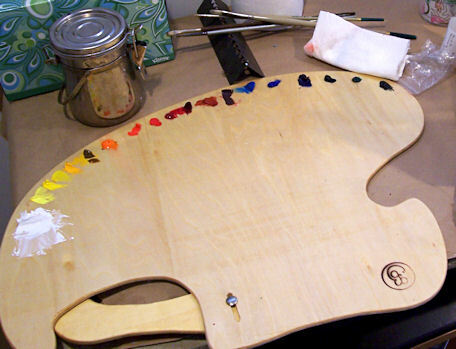 I went over to Jerry’s Artarama in Norwalk to check out what they had, and came away with this wonderful new palette. Today was my first opportunity to test drive it; I love it to bits! Now I’m glad I misplaced the old one. 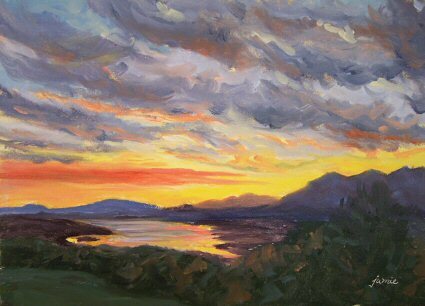 After a day and a half of working on the large painting in the studio, I took it back to the location a week or so later to work on it outside, where I could gather more information directly from the source once again. I felt lots of things were improved after that session of on site painting, but it still wasn’t finished. I’ve put in more time on it here and there as it’s sat on the big easel in my studio, and I think I can finally call it finished! 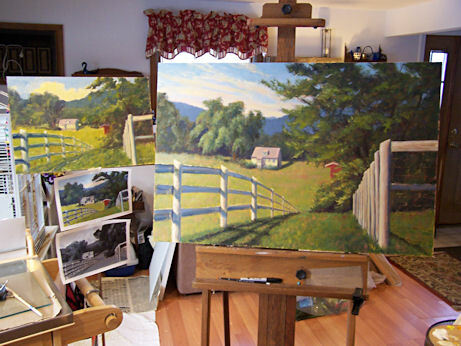 Here it is up on my studio easel during today’s session, with the studies next to it for reference. The studies are a progression toward the finished painting, but as you can see, I changed things that I wanted to improve upon in each version. 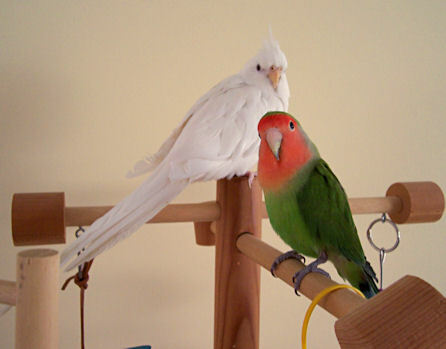 I’d like to remind my viewers that I am also on Facebook and Twitter. I post things there about my day-to-day life as an artist, tips and thoughts about the artistic process, and things not posted on my blog. It also gives me a chance to communicate in a more direct way with my friends, clients, family, and fellow artists and art-lovers. You can find me on Facebook here . Just click to add me as a friend. For those who have Twitter and would like to follow me as I tweet away (which is maybe once a day), you can find me here and click to follow me on Twitter . These miniature gems are too much fun to be legal! 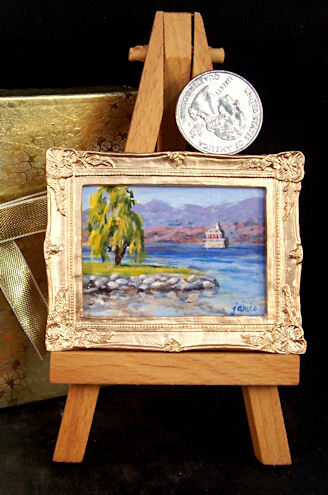 This is a miniature version of an 8×10″ painting that I did en plein air in the spring. You can see that painting by clicking here. I enjoy doing different size versions of the same scene. It gives me a chance to play with the composition and colors and try to turn out something even better each time. In this case, I shortened the peninsula so that the eye has a path around it to travel to the lighthouse. 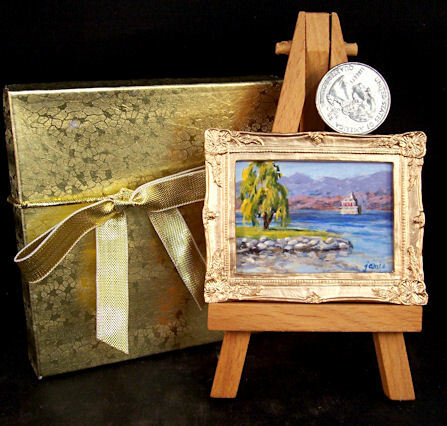 My miniature paintings come with a gift box and buyer’s choice of either a little table easel, or a golden thread affixed to the back and a tack for hanging salon style. 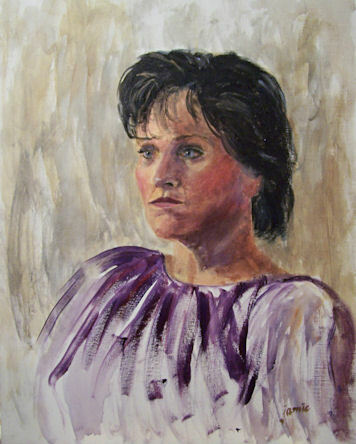 Here’s a slightly larger, cropped photo so that you can see the painting better. 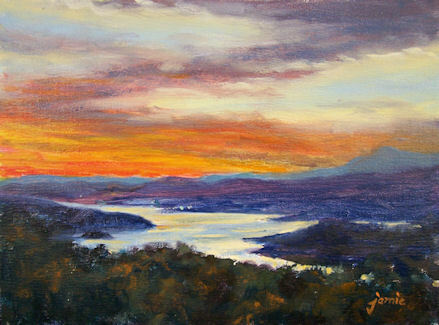 I wish this camera had a better lens so you could really see all the teeny tiny brushstrokes in there! So much goes into doing one of these miniatures. They take me longer than paintings many times the size. The first step in the process is to cut the support for the painting. In this case, I used four-ply Strathmore rag bristol. It’s a very expensive support, but at this size I could probably get 100 paintings from a sheet! I size that with Golden Matte Medium, because I love the way acrylic paint takes to that sized surface. 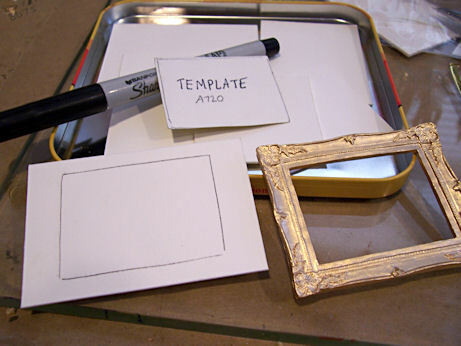 Using a template previously cut to size for that frame, I place it on the new support and draw the rectangle around it. 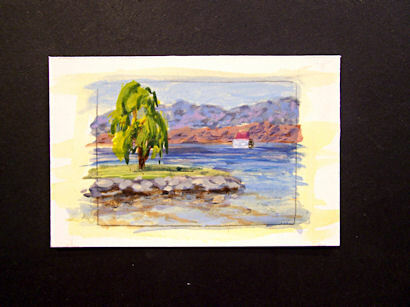 When I finish the painting, I’ll cut to the lines and will have a painting that will fit perfectly into the tiny frame. I put a tiny dot of blue-tack on the back of each corner, and affix my support to a piece of black foamcore that has also been sized with matte medium. The black helps reduce glare as I work, and makes it easier to support the tiny painting. 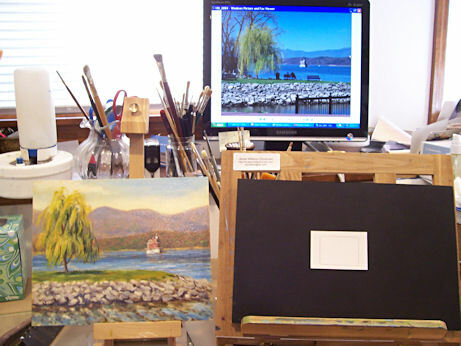 I set up my painting reference next to my easel, and put a photo reference of the scene up on the computer. 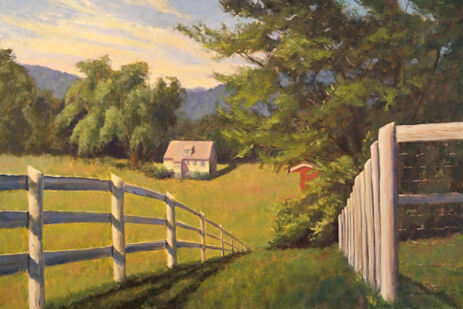 I can zoom in and out of the photo reference to help me with the details, while using the color from my plein air piece. I sketched in my composition with just a few pencil lines, the coated the whole surface with Transparent Yellow Iron Oxide. 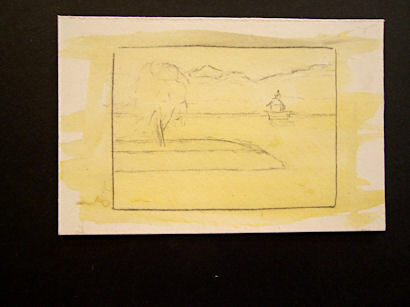 That served the dual purpose of sealing the drawing and killing the white of the support. This is as far as I was able to get without magnification! I have a goose neck lamp with a flourescent bulb and a built-in magnifying glass. I brought that over and worked a couple more hours to finish off the painting. The painting was then cut with an Xacto knife to fit in the frame. For the sake of the photo of the finished painting, I put it into the frame temporarily. It will actually have to come out to be sealed and then varnished in a week or so. Once that is dry, it will be glued into the frame, and a backing put on that will cover the painting and frame from behind, so it will look like it came straight out of a high end frame shop! Hopefully you now have an idea of what goes into turning out one of these little gems. They make great gift items.